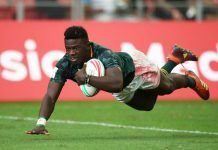 Scotland topped their pool for the second time this season as they shocked South Africa while Samoa upset their Pacific rivals Fiji and Australia as Paris played host to a day of sevens action at the Stade Jean Bouin. 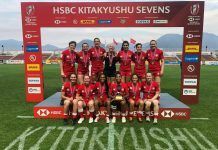 New Zealand and England also went unbeaten on Saturday as the penultimate round of the series saw some thrilling matches. With South Africa still on course to secure the series win, the quarter-finals on day two will see Scotland play Fiji, England take on the USA, Samoa are rewarded for their efforts with a clash against South Africa and New Zealand play the hosts. 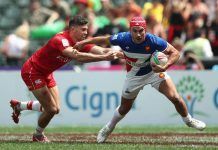 Day one also saw Canada, Argentina and Scotland cement their place at next year’s Rugby World Cup Sevens in San Francisco with just one qualifying spot left from the series, which looks likely to be filled by Samoa. The opening game in Pool A saw Scotland take on South Africa with the Blitzboks in touching distance of the series title. Only Neil Powell’s men can say whether their eyes were on the bigger prize as a hungry Scottish side tore into their opposition. A scintillating try from Jamie Farndale was just one of the highlights as the Scots ensured a famous 19-12 win against the series leaders. 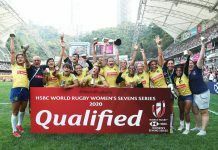 South Africa made amends later on Saturday as they eased past Japan, 35-5, while Canada fell to the Scots shortly afterwards, with the returning captain Scott Riddell getting on the scoreboard as they beat the Singapore champions, 26-19. 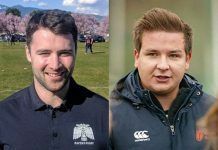 Riddell’s men went on to beat Japan making it only the sixth time Scotland won all three games in pool play in ten years. South Africa eased past Canada later in the evening 31-7 to secure their quarter-final spot. New Zealand brought two new faces into the side for the weekend in Paris, but it was long serving legend DJ Forbes who showed them the way forward as he marked the opening Pool B match against Wales with his 150th series try as the All Black Sevens eased their way to a 26-7 victory. USA were undoubtedly looking to make amends following their final disappointment at the last round in Singapore and they attacked Argentina with a superb try from Perry Baker. The two sides traded scores before USA showed their class, eventually winning 26-19. New Zealand and Argentina were tied at half-time after a try a piece from Regan Ware for the All Black Sevens and Argentina captain Gaston Revol, however tries in the second period from Tim Mikkelson and Sam Dickson saw the Kiwis ensure a second win of the day. It wasn’t a great day for the South Americans, and Argentina’s clash with Wales was only notable for being the highest aggregate score of the entire season, with 11 tries in the match as Wales won comfortably, 47-28. No two teams have scored more points in a match all season. New Zealand completed an unbeaten day one with a comfortable 27-14 win over USA; a try by Tone Ng Shiu after a beautiful offload helped to leave the All Black Sevens at the top of the pool after an impressive day at the home of Stade Francais. The game saw Perry Baker add another two tries to his six for the day, reaffirming his position as one of the top try scorers in the game. A massive roar greeted the opening Pool C encounter when Kenya ran out against hosts France, as the sun appeared for the first time over central Paris. 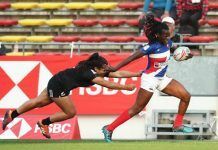 While Kenya were not in the mood to just make up the number and led 14-5 at the break, France got back into the game and a remarkable try, started and finished by the returning Virimi Vakatawa, had the rugby world talking and the hosts celebrating a 22-14 win. England beat Spain 31-0 in their first game of the day and had it their own way for most of the match against France in which Tom Mitchell and Dan Norton combined beautifully to score and seal a 24-7 win. France were made work hard by Spain in the last match, but five tries, including two from Jean-Pascal Barraque saw them run out 33-0 winners. England found Kenya tough in the last match of the day and will be content with a 12-12 draw to progress to the semis, however the draw was marred by a knee injury to the influential Dan Bibby. Perfect conditions for sevens rugby saw the day get underway with Olympic champions Fiji take on Samoa. 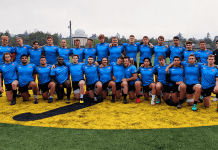 Under new coach Gordon Tietjens the Samoans have had mixed fortunes this season but took the field in good spirits on Saturday morning. The opener turned out to be something of a classic, with tries, offloads and open, running rugby entertaining the early morning risers as the Samoans matched their Pacific rivals, holding out until the end for Tila Meoloi to cross under the posts and the resulting conversion sealed the win. Australia beat a resilient Russian side 19-12 in the following match before Fiji put the Russians to the sword with a 54-0 victory later in Pool D.
Samoa later guaranteed their place in the quarter finals with a 19-19 draw against Russia; they had to rely on replacement Francis Ieremia to score in the final minute to deny Russia a famous scalp. 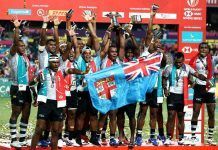 Australia were no match for Fiji in the last Pool D match, as tries from Kalione Nasoko and Vatemo Ravouvou in the second half put the game out of sight to finish 31-14 in favour of the Olympic champions.